2. The Frontrow Is Not For The Fragile!! 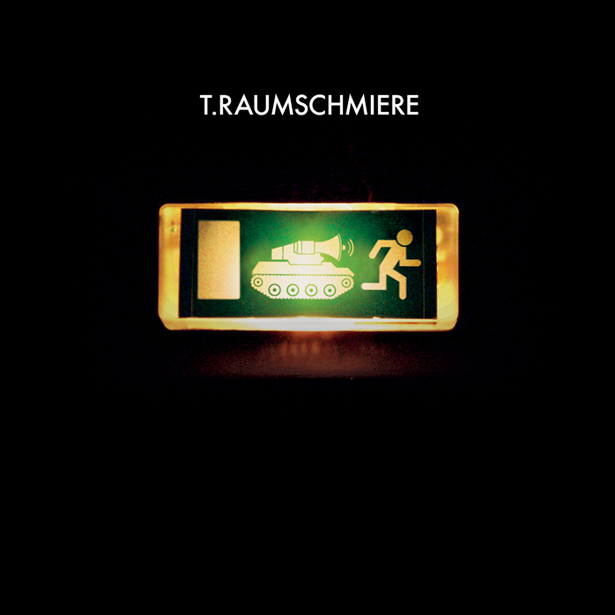 After years of waiting, Marco Haas aka T.RAUMSCHMIERE is finally releasing his next grand album, “I TANK U“!!! It definitely means a ball, seeing that the album completes the series of the two previous Mute albums, RADIO BLACKOUT and BLITZKRIEG POP – being a grand finale to the triptych. “I TANK U“ is the end result of a musical progress: It's dark electronica, techno history, songwriting, jammed in a terrific rock record. It rocks violently, and therefore, it's being released as a feature album on Marco Haas' own label, SHITKATAPULT. The number of featuring guests on this album is remarkable. Not only you can hear a (real) band playing more than ever before, but due to all the guest vocalists, this album contains no tracks but songs! Many names may seem surprising at first: the notorious energy rappers from DEICHKIND with THE CRACK WHORE SOCIETY on the swansong “BRENNER“, the alien rappers from the PUPPETMASTAZ collective on “ANIMAL TERRITORY“, the great TIM VANHAMEL from dEUS and MILLIONAIRE, the artist duo WARREN SUICIDE, as well as Dutch LILIAN HAK and the newcomer Berliners BARBARA PANTHER and GENE SERENE. “I TANK U“ is a very compact album and its breaches make its beauty complete. The rapping techno beats, cranky patterns, eerie melodies and those front row beasts gushing with energy do not compete with each other, but create an entity together: stories on sawtooth. This is due to the strikingly tight sound. The live drums and guitars (T.R. Live band members Andi Paruschke & Ben Lauber, assisted by sound engineer Allert Aalders) meet generated synth sounds and distorted bass lines. It’s the unbelievable compression that keeps everything together. After all, it's the two instrumental tracks (the dark half-beat title track „I TANK U“ as well as the first single and techno hit „E“) and the rock tunes – sung by Mr Haas himself – “CRACK A SMILE“ and “THE FRONT ROW IS NOT FOR THE FRAGILE! !“ - and the analogical mixing by Moses Schneider (TOCOTRONIC, BEATSTEAKS) that make “I TANK U“ more of an electronic rock album than a rocking electronic album: it's musick in arms!! This release is, of course, something special for SHITKATAPULT in many respects, but it also takes its place in line brilliantly after “WALLS“ by APPARAT and “REQUIEM FOR A MISSING LINK“ by WARREN SUICIDE. Whereas the whole scene may be wailing the crisis it's going through, the Berliner label got courage and defies the prevailing pessimism by doing whatever it fancies and saying no to all strictly defined label boundaries such as techno or electronica, rejecting any categorisation whatsoever. It's all just music, and what more is there than that?